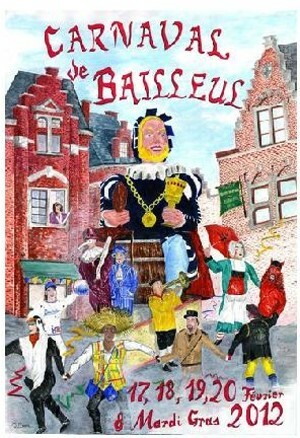 The inhabitants of Bailleul celebrate carnival with five days of processions and other festivities. The carnival has taken place since 1853, when the Philanthropic Company of Bailleul was founded. During the event, a search takes place for the needy ones of the city. The Gargantua Giant chairs the festivities, seated on his float and accompanied by his kitchen boys. At the end of Shrove Tuesday Mardi gras (5 March 2019 ), after the final procession of around 50 floats, with local groups, brass bands and plenty of confetti, Doctor Francisco Piccolissimo tries to cure the excesses of some inhabitants in an unconventional way in front of the town hall, and the festival continues late into the night in the town’s cafés and bars. In March the town of Bailleul (59 Nord, Hauts de France) celebrates the “International” Potjevleesch festival, although you do somehow doubt if there will many entries from the UK. This is a local Flemish dish (often found in the country around Dunkerque and Lille) which literally means “meat casserole” or potted meat. The peculiarities are that it usually contains 3 types of meat, traditionally chicken, rabbit and veal shin slowly cooked – AND it is served cold in its own jelly. So when I first asked what it was in the restaurant to be told it was a meat casserole, I expected something hearty and warming! It was certainly tasty, and is clearly popular with the locals. As there is no locally grown wine in the region, you can accompany the dish with some of the local and Belgian beers which are widely available – France and Belgium do seem to merge in this region – it was really only the different roadsigns which draw your attention to having crossed an international frontier – that and the use of the pretty impenetrable Flemish language!